Herzogenaurach, Germany (20 August, 2015) – World’s Fastest Man and 14 times World & Olympic Gold Medalist Usain Bolt returns to Beijing in confident mood ahead of the 15th IAAF World Championships. “I’ve been training hard these past few weeks to put myself in the best possible condition to run well and defend my titles over the next week”, said Bolt at the PUMA JAAA Press Conference. “Training is so important, I don’t think people realise sometimes how much work goes in to put an athlete in the condition needed to compete on the World stage. It’s a lot of hours on the track and in the weights room. It sometimes looks easy on the track but there is a lot of hard work done behind the scenes to get there. 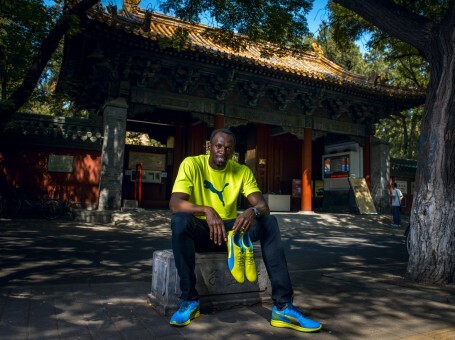 Usain Bolt has worked closely with PUMA for more than a decade, with the Global Sports brand equipping him with innovative running and training wear. PUMA has recently introduced the IGNITE Runner and XT training shoe that Bolt wears when training on the track and in the gym. IGNITE is PUMA’s most responsive running shoe, designed for maximum energy return, comfort and durability. Powering every stride is IGNITE Foam, a proprietary foam which provides responsive cushioning and optimal rebound. IGNITE Foam is a PU blend created based on extensive research of high-energy return and longer durability. The all-new IGNITE XT is a cross-training shoe geared for athletes looking to maximize energy and movement throughout their high intensity workouts. The full-length flex groove enables fast and dynamic multi-directional movement. Additional heel thickness on the medial and lateral sides support side-to-side movements.